Builders continue the modest rise in new home sales as reported by HUD and the Census Bureau. August new home sales, annualized and adjusted for seasonality, increased to 552,000. The August level was up 5.7% from an upwardly revised July and represents the highest level since February 2008. 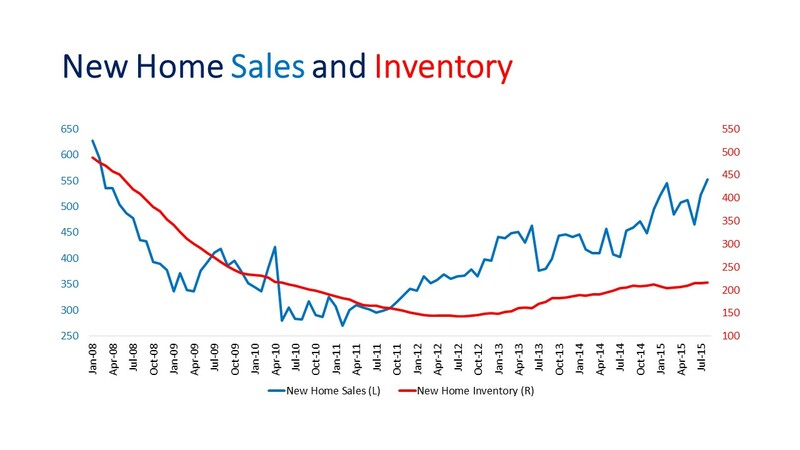 The steady, albeit modest, progression of new home sales reflects the steady increase in economic improvement, in job additions and consumer confidence. Home buyers are taking advantage of historically low mortgage rates, and pent up demand from years of a slow housing recovery. The inventory of homes for sale advanced slightly to 216,000, the highest since April 2010 when builders were still disposing of excess inventory from the collapse of 2008. At the current sales pace, it would take 4.7 months to sell the inventory, which is well below the 30 year history average of 5.9 months. A faster sales pace and difficulties acquiring buildable lots and labor have constrained builders’ ability to respond to growing demand. However, the single largest constraint has been the lack of demand and the slow resale market which is the source of most new home buyers. Regionally, sales increased 24.1% in the Northeast, 7.4% in the South and 5.4% in the West from July. Sales declined 9.1% in the Midwest. Annual increases were all double-digit, ranging from 21.6% for the US to 11.4% in the West.